Case management facilities are designed to help application developers create applications that support multi-level case relationships among work items. 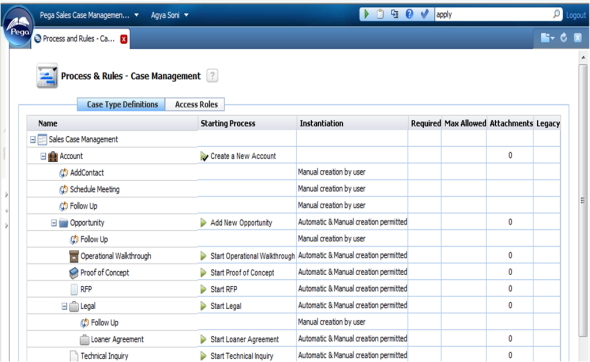 In 6.2, Case Management features become "universal". By default, every new application can take advantage of the power and flexibility of the Case Designer landing page and gadget, the new Case Manager portal, and the redesigned user forms. Also, every new application can grow, if necessary, into a full case management application through natural evolution; there is no need to start over or perform extensive refactoring. The My Cases tab provides access to all open cases to which the user is a party, even those with no current assignments for the user. The My Events tab highlights the dates and times of goals and deadlines determined by service levels and the dates of subscribed-to-events. The My Dashboard tab provides access to worklists for yourself and others in the work group, plus speedometer charts and reports that allow near-real-time monitoring of work in progress, and completed work. The My Reports tab displays the Report Browser and includes access to the Report Viewer. Case Designer gadget — The Case Designer gadget is enhanced to provide developers with greater control over the structure, relationships, and automatic or manual processing that occurs within a case. See Introduction to the Case Designer. When you save a Case Type rule, the system automatically generates the Declare Trigger rules that support the calculations on the Calculations tab. 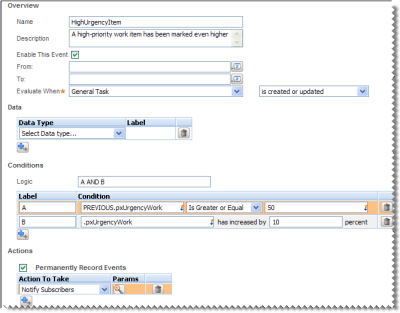 The Case Type rule form allows you to reference a work parties rule, optionally overriding a work parties rule in a flow rule. You can also review or enter calculations through the Properties > Data Aggregation menu of the Case Type Definitions landing page. The Properties > Data Propagation menu option lets your application copy property values from a case to subcases automatically at runtime. You can specify a custom icon for a work type in either the Case Type landing page or in the Application rule. At runtime, this icon appears in the My Cases tab of the Case Manager portal, and on the user form. Business events —Managers can define business events which instruct the system to constantly monitor work items in their application for unusual or important conditions. 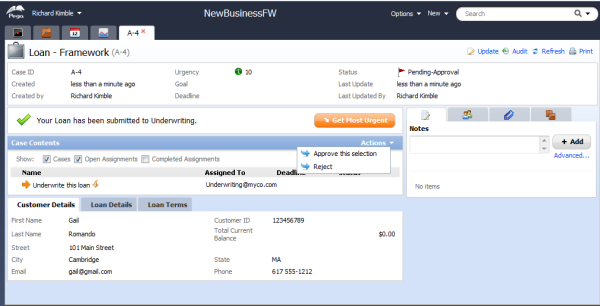 When a condition is met, the manager and others who have subscribed to that business event are notified by email. See How to create and subscribe to business events.